The AIS module is an optional module of ScanNav. When active, it lets you visualize on screen all boats equipped with a transmitter (required above 300 tons), and manage anti-collision alerts. 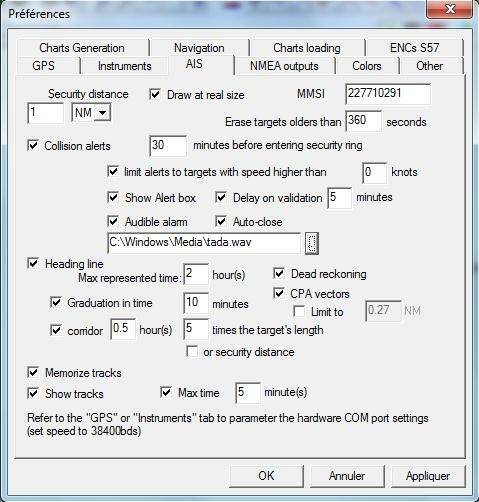 Radar ARPA or MARPA targets are also managed starting from version 10.1 of ScanNav. "Show Targets": Lets you globally show/hide the display of AIS targets. Warning: if this option is unchecked, no target will be displayed. "Targets list": To display targets in a list. See appropriate chapter further in this document. "SSN position reports Import" : See appropriate chapter further in this document. Note: entries of menu "Options -> "AIS/ARPA" are also available dispatched under menus "File" and "View" for historical reasons, so as not to disturb habits. They will be removed from these alternate locations in further releases. 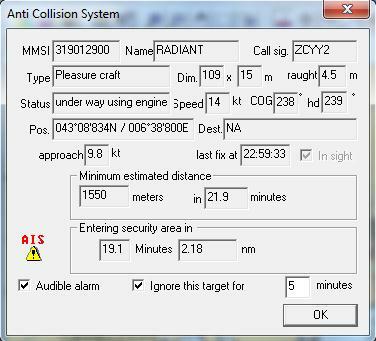 In case of collision risks, an audible alarm is triggered, and a window opens showing all properties of the target, as well as alert conditions (approaching speed, minimum estimated distance (CPA/TCPA), etc...) . This window can also be opened on demand using the "properties" button in the AIS list view. You can tune all display and alert options using the preferences window. To access, use menu "File" ==> "Preferences" and go to the "AIS" tab. - "Draw at real size": If this option is checked, targets for which dimensions are known will be displayed at real size when the zoom factor is sufficiently high. -The MMSI number only needs to be given if you have a transponder on board. The MMSI number entered in this field will be ignored by ScanNav. If you do not enter it, you will have collision alerts with your own boat. If you just have an AIS receiver, you can just leave this field to 0. - Alerts may be audible ("Audible alarm") and/or visual ("Show alert box"), and the alert window may stay opened or close after the alert conditions are safe ("Auto close"). On another side, targets in alert condition are highlighted on screen to distinguish them more easily. - "Delay on validation" lets you ignore alerts from a given target for a given period, once the alert box is validated. (this option can also be changed in the alert box when it appears before closing it). -The length of the Heading line can be set according to time. It can also be graduated in time steps as for your own boat (but independent parameters). A corridor with a width proportional to the target's length can also be shown. - If "Memorize tracks" is checked, all targets positions are logged as tracks for the current session. These tracks will be displayed or not according if you check or not the "Show tracks" option. - A "Maximum time" value can be set to limit the visible section of the AIS tracks to a given amount of time since the last known position. This will avoid an overloaded display, still keeping the essential information. The full tracks may be recovered at any time by unchecking the option. If "CPA vectors" (Closest Point of Approach) is checked, a vector will be drawn between your own boat and targets to show the estimated position of both boats at the time where they will be the closest to each other. You can therefore see on the example at the left, that your own boat (in blue) will pass behind the AIS target. "Dead reckoning": When checked, ScanNav will estimate the position of targets that do not emit anymore, according to their last known position/heading/speed. In this case, the target is shown at it's last known position, and a first segment with a dashed line will show the estimated route done since. 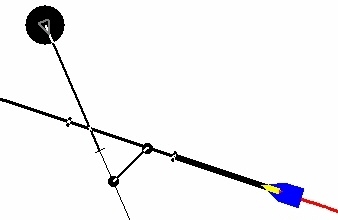 The estimated position is therefore at the end of the dashed line segment. All available information for each target are displayed as separate columns. You can sort the list according different criterias by clicking on the columns headers. "Center" button will center selected targets on the chart. If several lines are selected, ScanNav will modify the scale so as all selected targets show up on the chart. When right clicking on the map at the position of an AIS target, all targets intersecting this point will be listed at the end of the menu. Selecting one of these entries in the menu will open the list view with the corresponding entry selected. The AIS module also lets you visualize SSN position reports, used for tracking fishing fleets. Boats are visualized as AIS targets including their tracks. To import SSN reports, use menu "File" -> "SSN position reports import"
When possible, plug your GPS to the AIS receiver, then the AIS receiver to your PC with ScanNav. In this case, and if supported by the AIS receiver's possibilities, it will send the GPS positions together with it's own sentences. In this case, you just have to modify the settings in the GPS tab of the ScanNav preferences, to position the speed at 38400bds. although most AIS boxes only retransmit GPS data, a few also retransmit any NMEA data received from a multiplexer. Some AIS hardware also include an integrated GPS (case of most transceivers). In this case, you might not need an additional GPS if the AIS retransmits the GPS info. The configuration is in this case the same as 1 above.